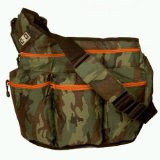 Diaper Dude is not your average diaper bag. It was designed with dad in mind and would make a great gift idea for the new Daddy. It's a cool diaper bag that comes complete with changing pad, cell phone holder and key ring for dads on the go. Diaper Dude is compartmentalized and has enough space to hold the essentials needed for a day out with daddy. It is form fitting to the body, comfortable, hip and affordable. And moms love wearing it too! Bag measures approx. 16" wide x 14" tall x 4.5" deep and offers several color options.